A traditional fun-filled family pantomime Friday 5 – Wednesday 31 December 2014. 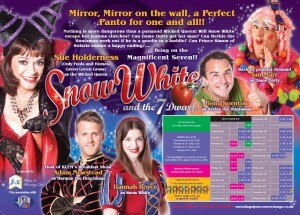 Mirror, Mirror on the wall, a Perfect Panto for one and all!! Nothing is more dangerous than a paranoid Wicked Queen! Will Snow White escape her jealous clutches? Can Dame Dotty get her man? Can Herbie the Huntsman work out if he is a goodie or a baddie? Can Prince Simon of Sofaria ensure a happy ending?Bring on the Magnificent Seven!! Starring Sue Holderness (Only Fools and Horses, Green, Green Grass) as The Wicked Queen and back by popular demand Ian Marr as Dame Dotty. 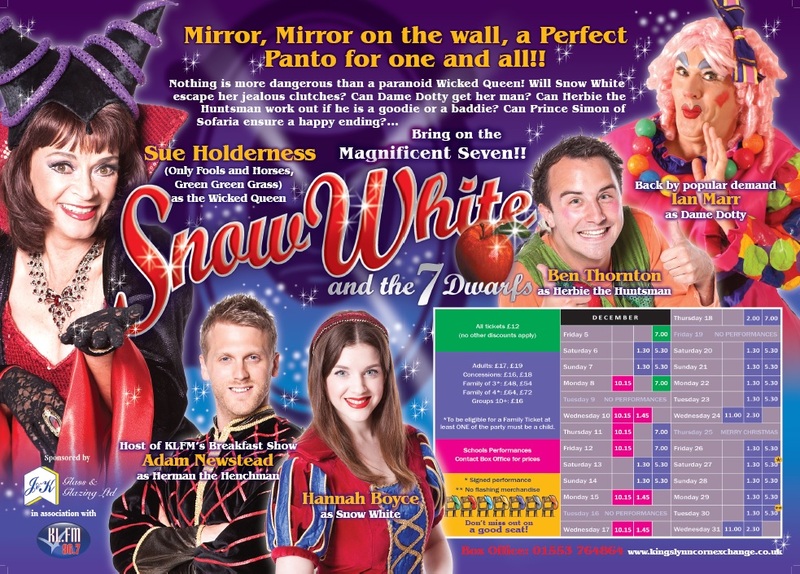 Also starring Hannah Boyce as Snow White and Ben Thornton as Herbie The Huntsman. Tickets: £12 – £18. Concessions, Family tickets and Group Discounts available.